In the wild, boa constrictors don't need someone cleaning up behind them; if they defecate or shed, they just move on. They can't do that in captivity. 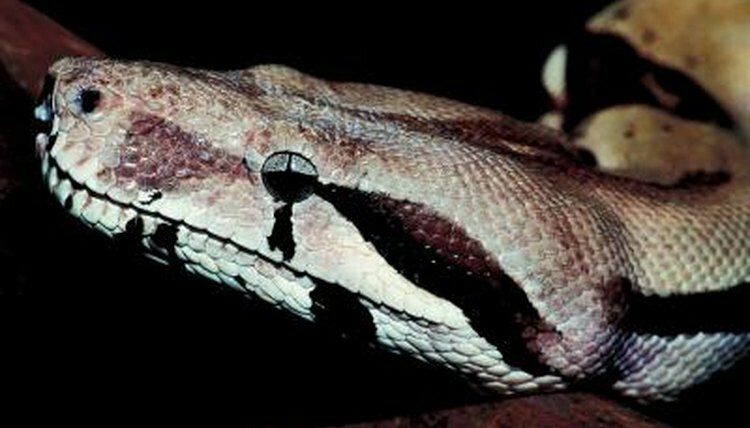 Persistent dirty habitat conditions can cause illness or infection in captive boas. Cage cleanliness is one of the most important parts of boa constrictor husbandry. Selecting appropriate cleaning agents for a reptile cage is a balancing act; your goal is to kill most microbial organisms while leaving your boa constrictor unharmed. The safest and most effective method of disinfecting your cage is to use a handheld steam cleaner, but you must take care not to burn yourself or melt plastic parts of the cage. Remove your boa from the cage before using a steam cleaner. Chemical options include chlorhexadine solutions, iodine-based solutions, alcohol-based solutions and more. One of the most popular disinfecting agents is a simple 5 percent bleach solution. Consult your veterinarian when selecting chemical agents, always follow the manufacturer’s instructions, and be sure that cages and furnishings do not have residues or odors before you put your boa back in his cage. Visually inspect your boa’s cage every day. Ensure that the water dish is full and clean, and that the snake hasn’t defecated, vomited or shed. Smell the cage daily; your nose can alert you to problems buried under the substrate. If misting is part of your husbandry, ensure the cage is clean before you mist. Daily inspections pinpoint issues that require immediate attention. Water spots on the cage glass and similar issues can wait for a more thorough cleaning. When your snake defecates, excretes uric acid, vomits or sheds, you should perform a thorough cage-cleaning. Remove the snake to a temporary enclosure – soaking your snake in an inch or 2 of lukewarm water during cage cleaning is a great maintenance practice that encourages boas to defecate outside the cage. Remove and clean the water bowl and all of the cage props or furniture; wash impervious items with 5 percent bleach solution or whatever chemical agent your veterinarian recommends. Permeable items like wood should be washed with very hot water and a steel brush; but even this will not fully disinfect them; you'll have to periodically discard and replace. Remove and discard the substrate at each cleaning. Wipe down all sides of the enclosure with the bleach solution and allow the cage to completely dry -- make sure you can’t smell bleach at all before putting the furnishings and new substrate in the cage. Once per month, completely break down the cage and sterilize it. It is crucial to take apart all parts of the cages that will come apart, and pay special attention to cleaning the tiny nooks and crannies of the cage. An old toothbrush can help to reach these places. Hose aquariums down outside; you'll have to work on larger cages where they sit. Allow the water bowl and impervious cage tools to soak in a disinfecting solution for at least one hour or as recommended by the manufacturer.